After what seemed like an endless winter of torrential rain and frosty nights, summer has finally peeked its head over the weekend with two days of glorious sunshine. And what do kiwis do when it's summer? We BARBEQUE! And with that first hint of summer, we were off to the Piha bach for our first summer barbie: Garlic Butter Scallops and Char-grilled Vegetables with Chilli and Garlic Balsamic Vinaigrette. Piha is about a 40 minute drive from Auckland CBD over the the Waitakere ranges and is one of the most stunning beaches on the West Coast. It's ruggedly beautiful: all rough and harsh with black sand, steep cliffs and massive surf. C's family has had a bach there since they were little kids. C, his Dad and his brothers are all lifeguards at the Piha surf club. They have been surfing, swimming and life guarding here for years but it's still hard to ever get used to how beautiful the place is. C and I spent went out for the day on Sunday. C did some manly jobs like cutting down trees with a chainsaw and I lazed on the couch reading a book sipping homemade lemonade in the sun. As a bit of an adventure, we took the camera out in the evening light and did some walks up Lion Rock and up the headland over White's Beach and got trigger happy. 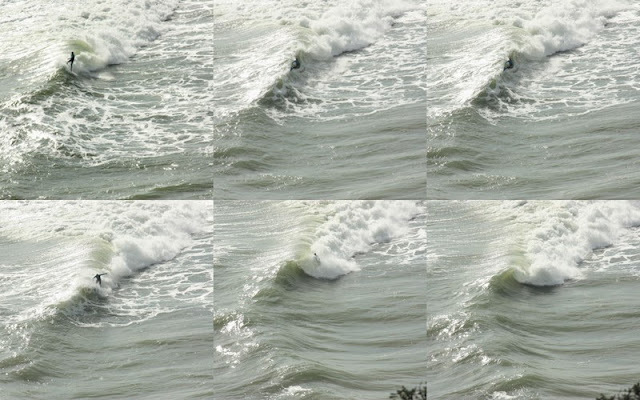 Thanks to an uber flash telephoto lens C's dad gave me, we got some pretty awesome photos of surfers weaving through the waves from the rocks. It was incredible - the lens was so zoomy you felt like you were right there with them out there in the line up. C proved to be quite a adept hand at the old surfing photography and it was pretty hard trying to wrench my beloved Canon off him once he got clicking. I can barely swim so watching the surfers do their thing and getting thrown about by the massive waves had C amping to head out for a surf and me silently glad to be on dry land and rather hungry just watching them exert themselves. Nothing like watching other people do physical activity to work up a good appetite I say. So it was back up to the bach for a good old kiwi barbie. O grilled up some garlic butter scallops and char-grilled veges with balsamic dressing while D and I cooked up mushroom risotto and asian greens with soy garlic and sesame oil inside. Eating delicious food with family, on the deck while watching the sun go down over the ocean, you couldn't help but feel like you were on a little patch of heaven. optional: chopped flat leafed parsley to sprinkle over when serving. 1. Heat the bbq to medium heat. Put the butter and garlic on to the hot place and wait for the butter to melt and the garlic to start to sizzle. 2. Place the scallops on to the hot plate and cook for only around 40 seconds on each side. Season lightly (remember the butter is salted). 3. Scoop up with the scallops with the garlicky buttery sauce and serve. option: you could just as easily do eggplant, fennel or haloumi in the same way. 1. Brush the vegetables with a little oil and heat up the griddle on the bbq. 2. Grill each side for around 1 minute on each side. 3. Mix all the vinaigrette ingredients, season to taste and spoon over vegetables while still hot. 4. Can be served hot or cold the next day. What an awesome bbq! That view looks amazing, and I bet that food was so delicious! Your photos are gorgeous and make me jealous! Recipe sounds delicious as well :)! How lucky for you summer is begining, ours ended but also never really began... :( This all looks so good. Loveing the scenery too. Peggy: Love bbqs ay! There's nothing like eating outside on a cool summer night - makes the food extra delicious.